The dark cloud cover bearish candlesticks pattern is the opposite of the piercing line. In order to provide a valid signal an uptrend must be in place. Bellow follows its graphical representation. The red candlestick opens with a gap up but finally closes below the mid point of the green candlestick. This is a sign that after a price advance, sellers are taking control. 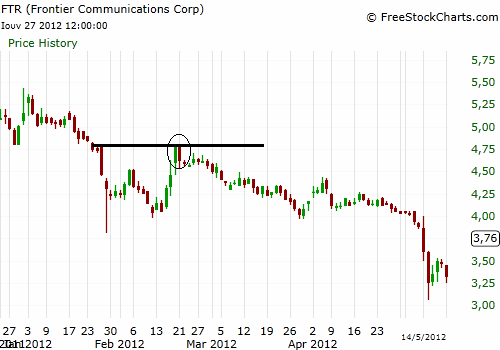 In the daily chart of FTR (below) price advanced to a strong resistance point in the context of a downtrend. This is by itself a high probability trade. The dark cloud cover candlesticks pattern in the circle, gives additional credibility to the set up. The stop loss in this trade should be placed above resistance. We can open a short position exactly when price visits the resistance at $4.75. In that case the stop loss will be very small and the risk will be minimized. We can also wait until the end of the session to see if a bearish candlestick pattern will be formed. In that case we will enter at the close of the red candlestick, on the base that we have a dark cloud cover, but the drawback is that the stop and the risk will be larger. The advantage is that there is additional confirmation that a reversal will occur.